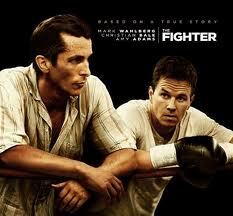 The Fighter is not so much a story about one boxer trying to make his way in the world as a story in which every character is a scrappy fighter in their own respect, each trying to achieve his or her dream in a gritty, realistic world bristling with testosterone and raw emotion, unstained by the airbrushing of Hollywood gloss. This modern day Cinderella story appears to be about boxing on the surface, an inspiring underdog story about a man who literally never quits. But in truth the film is much, much more. The pseudo-documentary style and directing create an unglamorous world which examines poverty, family, loyalty, love and, of course, boxing, all with a humanistic eye. At the core of the film’s strength is its impressively detailed peek into the complexities of family and family politics. Acting performances in the film deliver an array of raw emotion in a steady one-two of jabs and thrusts without the forceful injection of artificial drama, while its bold, aggressive characters allow Amy Adams and Christian Bale to thrive in their best acting roles to date—an impressive achievement considering both actors’ extensive experience. The Fighter, obviously more a labor of love than a labor of money, proves itself to not only be one of the best boxing films ever made, but one of the greatest family dramas of all time.